How Safe Are America's Passenger Trains? Charting nine years of Federal Railroad Administration data. Seven people have been confirmed dead in the Amtrak crash outside of Philadelphia Tuesday night. All seven cars of the passenger train traveling from Washington to New York City derailed, and some even tipped over, injuring around 200 in the chaos. "It's amazing so many people survived," Mayor Michael Nutter told CNN Wednesday morning, based on the wreckage he saw when he arrived at the scene of the accident. A passenger-train crash is like a plane crash in some ways: dramatic, frightening, deadly—but, thankfully, very rare. More people died last night on Amtrak than in all of the last 10 years. From 2006 to 2014, Amtrak saw only five deaths due to train accidents, according to safety data from the Federal Railroad Administration. The FRA defines train accidents as collisions, derailments, explosions, or acts of God—basically, incidents in which a train malfunctioned, due to mechanical or human error. In that same time period, there were 32 accident-related deaths on the nation's commuter railroads—think the Long Island Rail Road, MARC, New Jersey Transit, etc. More often, fatalities involve trespassers (people on tracks they shouldn't be on or moving between cars in an unsanctioned way) and incidents at highway rail crossings (like when a train hits a car). According to the FRA, these incidents accounted for 96 percent of train fatalities in 2013. In that year, there were 105 trespasser deaths involving Amtrak or commuter trains. The FRA also measures safety on railways in a ratio—accidents per million miles traveled—which makes it easier to compare safety records across railway operators. Amtrak's rate is higher than that of commuter railroads, but not by much. 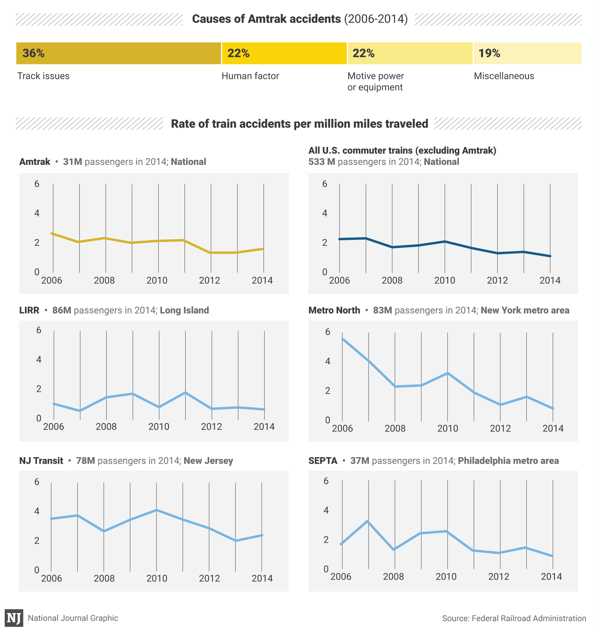 From 2006 to 2014, Amtrak saw an average of two accidents per million miles. On the nation's commuter railroads, that figure was 1.8 accidents per million miles. The FRA also tracks what causes train accidents. More often, with Amtrak, accidents occur due to track error (35.89 percent of accidents) over human error (22.33 percent).